(1) Young Jacob (Jake) Singer posing in front of his store. (2) An advertisement (a postcard?) for Singer's Main St. grocery store. (3) Event in basement of SOA. (4) Jacob and Rebecca Singer, probably during Florida vacation. 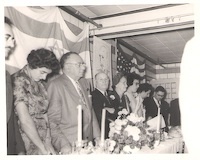 (5) Kiddush in SOA. Singers are center back. (6, 7) Probably a baby shower. Adele Goodman (Sharon's mother) is woman in front row with glasses (fourth from the left). Thank you note on reverse side. Who are Rita and Clarence? 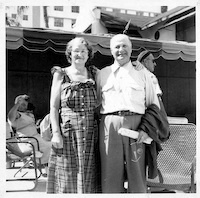 (8) Harry and Esther Goodman, Sharon's grandparents, Lafayette.